The common pheasant (Phasianus colchicus) is a medium-size bird with multicolored plumage and a white ring around its neck. Thirty-four subspecies are known, all of which have similar habitat requirements such as plant foods and cover areas. Common pheasants are native to Asia. They have been introduced to North America, Europe, Australia, New Zealand and Hawaii. Common pheasants have a large, established range from southern Canada (west from British Columbia and east through Nova Scotia) southward through Minnesota. However, the northern reaches aren’t the only areas where these birds are found; they are locally distributed as far south as North Carolina and Texas. The common pheasant is an adaptable bird. Though they prefer open grasslands, pheasants also commonly occupy marshes, agricultural areas and even tropical habitats in Hawaii. Almost any temperate (or in some cases tropical) habitat that provides cover can serve as a pheasant’s home. As a non-migratory bird, a pheasant spends its whole life within a mile of where it hatched. Though they're adaptable, all common pheasants require areas of cover in their habitat. Typically this includes grasses and brush such as wheatgrass, alfalfa and sagebrush, but occasionally ditches, hedges, marshes and tree stands will be used. These areas of cover are crucial during the pheasant nesting season, when hens search out areas of grassy and herbaceous cover. Rich, loose soil with a nearby water supply provides the ideal foundation for a pheasant’s nest. The hen first digs a shallow depression in the soil. She then uses leaves and grasses to line her nest. 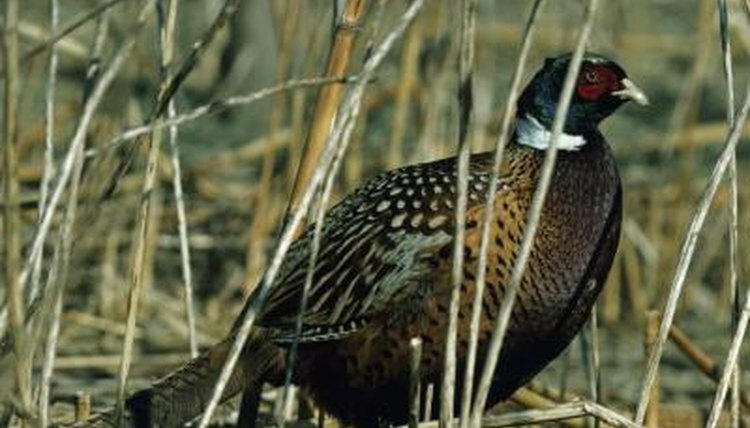 The perfect common pheasant habitat will provide her with adequate food and cover in which to nest and escape predation from foxes, coyotes and birds of prey. Pheasants are omnivorous, the majority of their diet coming from plant foods such as grains, seeds, shoots and berries, rounded out with insects and small invertebrates. Common pheasants do the majority of their foraging on the ground, where their favorite foods are corn, wheat, barley, flax, blackberries, grasshoppers, crickets and snails. Grasslands, shrublands and farmlands near a water source provide a wealth of food options for the common pheasant.